A multidisciplinary research team at the National Institute of Standards and Technology (NIST) has found that an organic semiconductor may be a viable candidate for creating large-area electronics, such as solar cells and displays that can be sprayed onto a surface as easily as paint. While the electronics will not be ready for market anytime soon, the research team says the material they studied could overcome one of the main cost hurdles blocking the large-scale manufacture of organic thin-film transistors, the development of which also could lead to a host of devices inexpensive enough to be disposable. Silicon is the iconic material of the electronics industry, the basic material for most microprocessors and memory chips. Silicon has proved highly successful as a substance because billions of computer elements can be crammed into a tiny area, and the manufacturing process behind these high-performance chips is well-established. But the electronics industry for a long time has been pursuing novel organic materials to create semiconductor products—materials that perhaps could not be packed as densely as state-of-the-art silicon chips, but that would require less power, cost less and do things silicon devices cannot: bend and fold, for example. Proponents predict that organic semiconductors, once perfected, might permit the construction of low-cost solar cells and video displays that could be sprayed onto a surface just as paint is. "At this stage, there is no established best material or manufacturing process for creating low-cost, large-area electronics," says Calvin Chan, an electrical engineer at NIST. "What our team has done is to translate a classic material deposition method, spray painting, to a way of manufacturing cheap electronic devices." 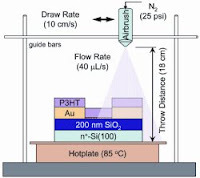 The team's work showed that a commonly used organic transistor material, poly(3-hexylthiophene), or P3HT, works well as a spray-on transistor material because, like beauty, transistors aren't very deep. When sprayed onto a flat surface, inhomogeneities give the P3HT film a rough and uneven top surface that causes problems in other applications. But because the transistor effects occur along its lower surface—where it contacts the substrate—it functions quite well. Chan says the simplicity of spray-on electronics gives it a potential cost advantage over other manufacturing processes for organic electronics. Other candidate processes, he says, require costly equipment to function or are simply not suitable for use in high-volume manufacturing.